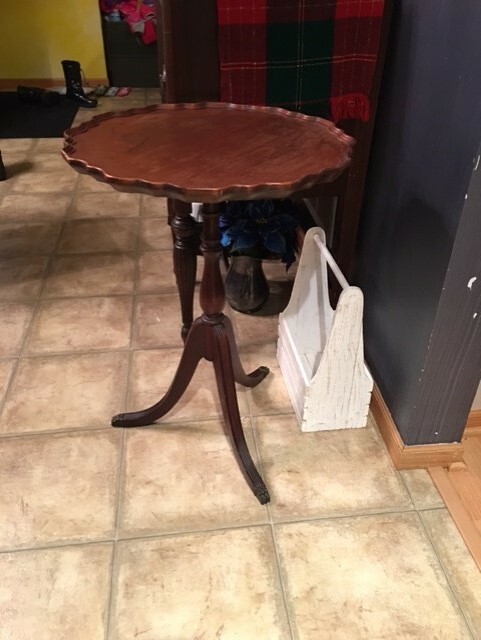 Okay so I fell in love with this little piecrust table I don’t know if it was the claw feet or the adorable scalloped edge. Whatever it was I had to take it home it was a little more pricey than I’m usually willing to pay but I sprang for that whole $12 anyway. 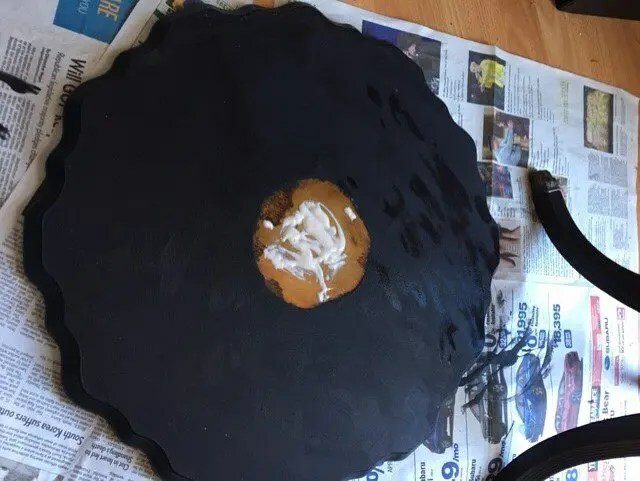 Yes, it was a little water damaged and had dark spots on it that were never going to come up unless I bleach the wood and I don’t have time for that. So I decided to paint was a way to go obviously. First I had to take the whole thing apart it’s always a good deal it’s a good idea to do this whenever you’re painting a table if it can be taken apart it’s just easier that way. 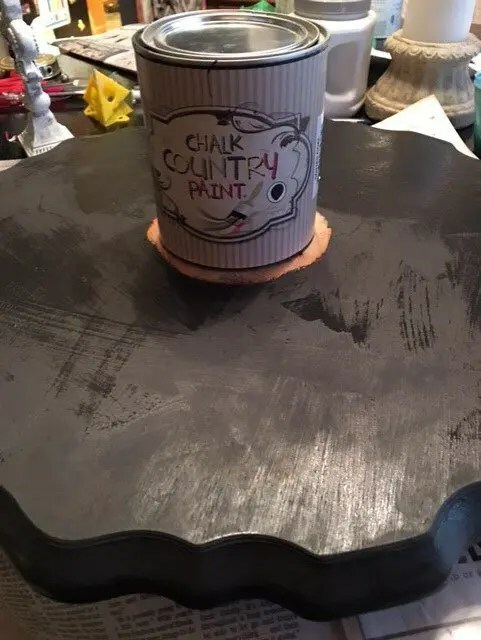 I decided to go with a black for this table I don’t know why it’s not my usual color I usually do white or blue or something out quite a bit lighter but I decided to go with black. I used Country Chalk in Santa’s Coal because it’s true black not like Annie Sloan’s which is more of a gray. And I had a left over can I wanted to use up. Going forward it will be the Bungalow 47 Lamp Post black. 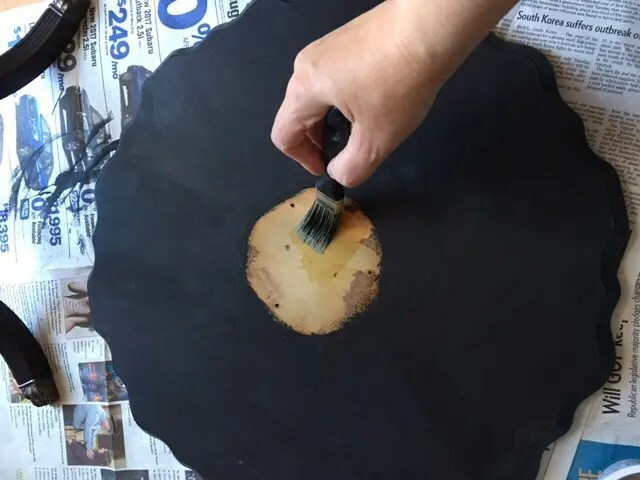 As you can see from the photo when they stain the piece originally they did it when it was altogether you could tell by the raw wood at the center I decided to paint around that would section too. I don’t know why. Continuity? But I did seal the raw wood to prevent future issues with moisture (I know I’m weirdly paranoid like that). 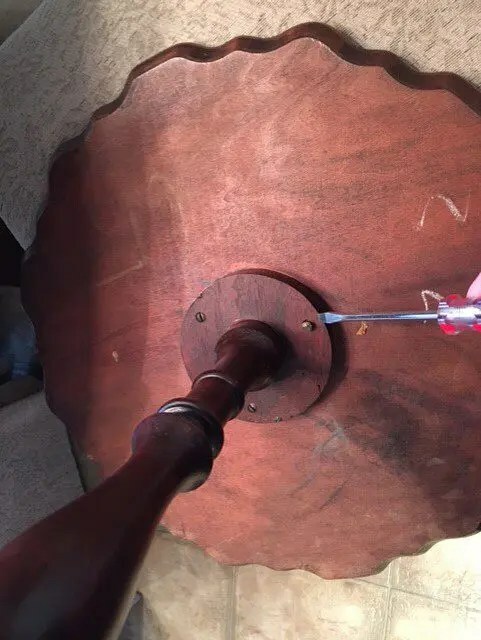 The wood was incredibly dry and the grain was wide open so the first coat which usually is enough to cover soaked right in as you can see from the pictures the cherry stain showed through. So had to do two coats at least. While the top was drying I did the base and yes you should flip over the base and paint the underneath. I hate when I see tables that are not painted underneath. It’s just lazy. Once all the coats were applied and dry I added a Varathane matte finish coat cover instead of wax. The Varathane makes the surface waterproof so people can set their drinks on it. If you use this as a side table or a plant stand and it happens to get a little wet it won’t damage the finish. I did two coats of Varathane. Once that was dry it was time to put the table back together. I used gorilla glue wood glue to secure the top and make sure the entire project was stable. I even filled the screw holes to make sure the screws, if they had been stripped before, didn’t come undone (did I mention weirdly paranoid). After everything was glued back into place it was time to address the claw feet. I love the patina that’s on them but I wanted them to stand out a little. Because the aging had created a dark patina on the claw feet you really didn’t see them against the dark paint. 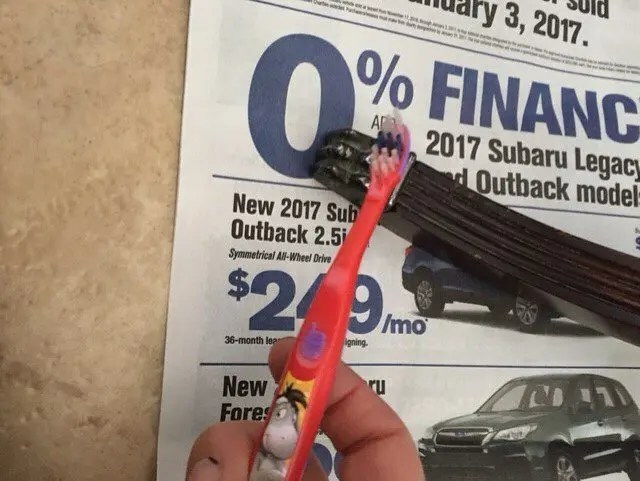 So I took some silver polish, and a very hi-tech cleaning tool an old toothbrush and cleaned the feet, but not so they were completely shiny. I still wanted them to have some age on it I just hit the highlights of the claw feet so that a little of the silver color would shine through. 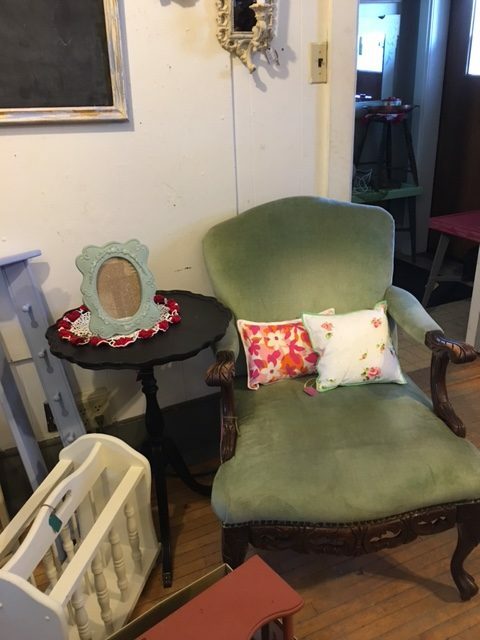 I really wish I had taken an after photo in my house but I forgot so I had to take a picture when it was in Picket Fence on display. It is really hard to let this one go I fell in love with it even more so after it was done (it’s definitely those feet). If it doesn’t sell in a couple months I might take it home and see if I can find a spot for it in my house.